This post is for reset the HP printer Photosmart D110, follow the next steps, if you have problem, please type a coment. 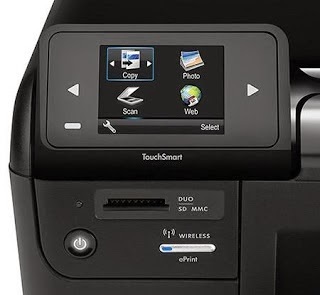 These printers are really good thanks to the All in One quality, with this printer you can scan, print and copy with quality thanks to the 60 HP black and tricolor cartridges of the same number. You can refill these cartridges how many times as you want or as much as the cartridges withstand, to refill them you can visit how to refill the 60 HP black ink cartridges and how to refill the 60 HP tricolor ink cartridge. There is even a really innovative way to reset the 60 HP cartridges with masking tape, this always works the fact is that this post is aimed to eliminate a resetting that is done to the printer in a way that the printer does not work, it means you cannot do anything with it. The error says “at least one of the cartridges is not recognized it can be the black ink cartridge or the tricolor ink cartridge” it is simply that you cannot get to the menu and so you cannot do anything. Follow the next steps to try to delete this error. Locate yourself in the front panel of the printer. The printer must be turned on and while being on unplug the power supply cable from the socket. do this really carefully, you can unplug the cable either from the printer side or from the socket in the wall. Plug the cable of the printer again to the power supply, after that being plugged press the ON/OFF button until the led in the top side of the printer light color white. It is a little difficult to see it but there it is. Next you will do a procedure which will take you to the point where you can do the resetting process, do this procedure carefully and read well before starting, it is a little complex but not impossible. To do so locate yourself again in the front panel of the printer as shown in the image, and start. This process will drive you to a blue screen where you are going to find the following options. Next step is to choose "MENU" and then click on the "OK" button and you will go to another screen, select "NEXT" and to do so select the button with the "X" symbol until getting to "NO PRINT MECH" and press "OK". After all this process the printer will take a time working, like if it were analyzing before printer, it is in this point that in the screen something indicating to print a test page, place a blank page and click on all the options presented "OK". Obviate any other option, even any error that may appear, continue with the process until finishing, do click on "OK", when needed. Look for the "RESETS MENU" option in the menu and press "OK"
Look inside the "RESETS MENU" and select the "SEMI-FULL RESET" option and press "OK" now the printer must be totally reseted, again it will ask you to select the language and all the initial settings like when using the printer for the first time.